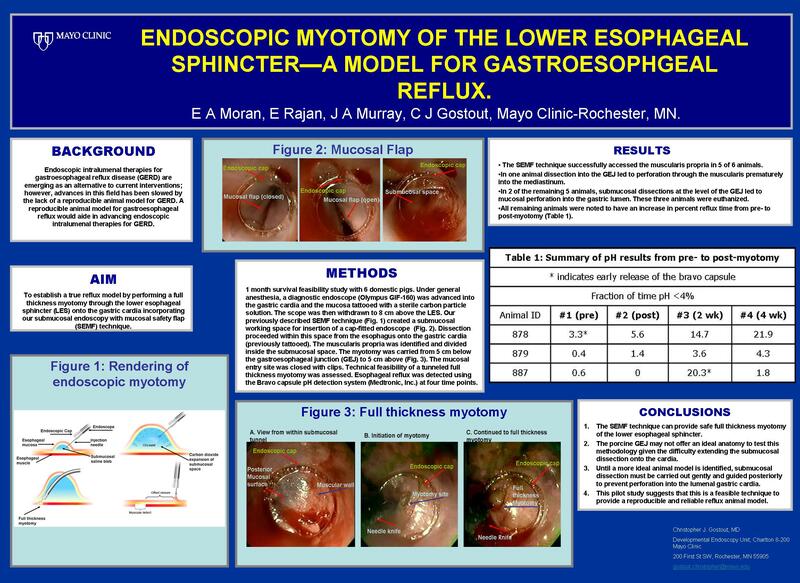 Endoscopic Myotomy of the Lower Esophageal Sphincter – A Model for Gastroesophageal Reflux. 1. Objective of the study: A reproducible animal model for gastroesophageal reflux would aide in advancing endoscopic intralumenal therapies for GERD. In this study we performed a full thickness myotomy through the lower esophageal sphincter (LES) onto the gastric cardia incorporating our submucosal endoscopy with mucosal safety flap (SEMF) technique in efforts to establish a true reflux model. 2. Description of the methods: 1 month survival feasibility study with 6 domestic pigs. Under general anesthesia, a diagnostic endoscope (Olympus GIF-160) was advanced into the gastric cardia and the mucosa tattooed with a sterile carbon particle solution. The scope was then withdrawn to 8 cm above the LES. Our previously described SEMF technique created a submucosal working space for insertion of a cap-fitted endoscope. Dissection proceeded within this space from the esophagus onto the gastric cardia (previously tattooed). The muscularis propria was identified and divided inside the submucosal space. The myotomy was carried from 5 cm below the gastroesophageal junction (GEJ) to 5 cm above. The mucosal entry site was closed with clips. Technical feasibility of a tunneled full thickness myotomy was assessed. Esophageal reflux was detected using the Bravo capsule pH detection system (Medtronic, Inc.) at four time points. 3. Preliminary results: The SEMF technique successfully accessed the muscularis propria in 5 of 6 animals. In one animal dissection into the GEJ led to perforation through the muscularis prematurely into the mediastinum. In 2 of the remaining 5 animals, submucosal dissections at the level of the GEJ led to mucosal perforation into the gastric lumen. These three animals were euthanized. All remaining animals were noted to have an increase in percent reflux time from pre- to post-myotomy (Table 1). 4. Conclusions: The SEMF technique can provide safe full thickness myotomy of the lower esophageal sphincter. The porcine GEJ may not offer an ideal anatomy to test this methodology given the difficulty extending the submucosal dissection onto the cardia. Until a more ideal animal model is identified, submucosal dissection must be carried out gently and guided posteriorly to prevent perforation into the lumenal gastric cardia. This pilot study suggests that this is a feasible technique to provide a reproducible and reliable reflux animal model.